It was a busy week in the library. We had our Scholastic Book Fair all week. I hope you had a chance to visit and find a great new read. Thank you to all the parent and staff volunteers who helped make it a success. 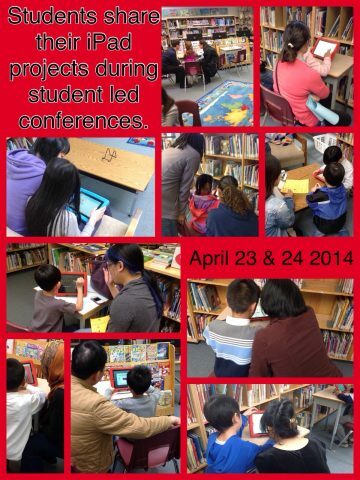 We also had student led conferences on Wednesday and Thursday. Many students came to the library to show their families our school iPads. 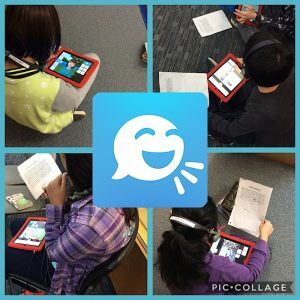 They shared imovies, ebooks, Haiku Deck poems and more! Last week Division 10 invited me to their first author’s circle. Students in Ms. Shuster’s class have been very excited about writing and have been publishing their books using the ipads. They have also been donating their books to the library and inspired me to create a new display of student writing. After seeing the display, many classes have offered to share their writing too. I can’t wait to see what they’ve written. Along with student books, we also have some new books in the library that I think will inspire any writer. This wonderful story by Amy Krouse Rosenthal and Tom Lichtenheld is about an exclamation mark struggling to fit in. Read it and learn just how important, and funny, punctuation can be. Have you ever had writer’s block? Well, then you’ll love Abby Hanlon’s new book about Ralph; a struggling young writer who can’t think of anything to write. His teacher tells him “stories are everywhere” and Ralph looks for them, even on the floor. After reading this book to a few classes, I would recommend it to writers and aspiring writers of all ages. Come check out the student display and these new books now! 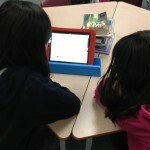 Students are beginning to use our iPads in a variety of ways. Last Thursday Division 3 used them in the library to read about author Eric Walters. They went to his site and had to report out about what they learned. Then they created a list of questions for his visit on March 11th. Stay tuned to find out what happened at our visit with this fantastic author.